Frantic Stamper Precision Die - Quatrefoil Card Panel. 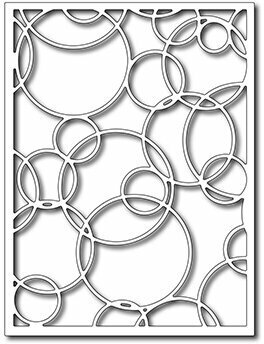 Our lovely Quatrefoil Card Panel measures 4" x 5.25" and creates a gorgeous latticed background which you can piece in for an inlay look. 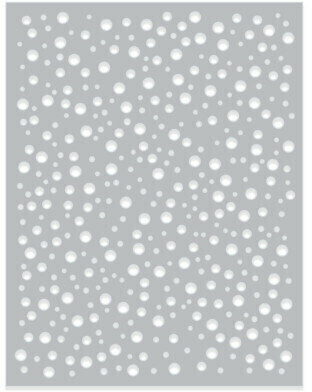 This fantastic on-trend card panel measures 5.125" x 3.875". It's great for making shaker cards, or to use as a background. This 5" x 7" Embossing Folder features a background of flowers. Compatible with most leading brand die cutting and embossing machines. 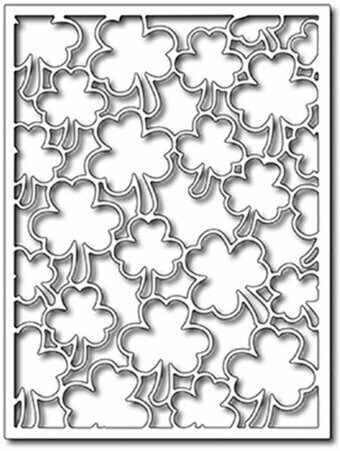 Frantic Stamper Precision Die - Shamrock Card Panel. Features a background of leaves. Size: 5" x 3.75". This die measures 3 3/4" x 5". These are US-made steel dies compatible with most table-top die cutting machines. Card Creator A2 Swirl Background Etched Dies Romancing the Swirl Becca Feeken is a set of two dies that includes an outline panel shape with its coordinating beautiful intricate panel insert design. Romancing the Swirl Collection by Becca Feeken is full of curl and swirl motifs that connect them to elements worthy of decoration and card making. This collection is a welcome addition to and matches well with her other collections in the Amazing Paper Grace line. Approximate Size: Outline: 4.25 x 5.50 in 10.80 x 14.00 cm, Pattern Insert: 4.05 x 5.35 in 10.30 x 13.60 cm. Shapeabilities Lucky Clouds Etched Dies Destination China by Lene Lok is a set of two dies that includes a rectangle outline and its insert piece full of playful cloud designs. From detailed frames to intricate accents to beautiful lanterns, Destination China Collection by Lene Lok is a wonderful grouping of Asian inspired elements to bring an exotic flair to your projects. Approximate size: 4.00 x 5.25 in. 10.50 x 13.50 cm. Halloween themed craft die featuring a spiderweb. These dies are compatible with most tabletop die cut machines. Bountiful Blossoms 3D embossing folder features beautiful deep florals in varying sizes. A new style of embossing folder, these 3D designs give an ultra-deep impression to craft work, for a striking effect that brings designs to life. A quality embossing folder that creates a deep and crisp emboss in card stock, paper, vellum, foil and many other surfaces to enliven any craft project. Includes 1 folder. Size: 5.75 x 7.5 inches..
Sue Wilson-Indian Ocean Collection-Background. Designed by Sue Wilson these cutting dies are an elegant collection of high quality steel designed to co-ordinate with each other. 7 dies. Sizes: Outside Die: 4.25" x 6.25", Smallest Die: 0.80" x 1.95". Background Collection - Ray of Light. 1 die. Size: 4.33" x 6.30". Creative Expressions Embossing Folder 8 x 8 Aztec Flowers. 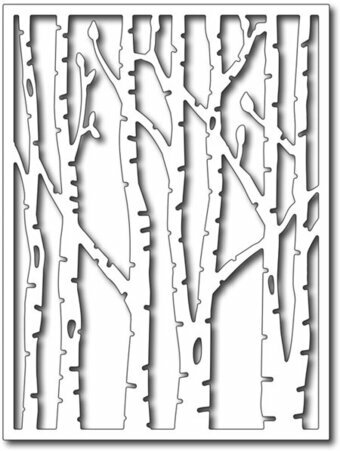 A cool background embossing folder and at the perfect size! Add gilding wax or polish to create a unique background! Perfect for feminine and masculine projects! Quality embossing folder that creates a deep and crisp emboss in card stock, paper, vellum, metal, foil and many other surfaces to enliven any craft project. 1 folder. Size: 8" x 8". Daisy Trail Pinpoint Embossing folder features an alternating daisy and line pattern. A quality embossing folder that creates a deep and crisp emboss in card stock, paper, vellum, foil and many other surfaces to enliven any craft project. Includes 1 folder. Size: 5.75 x 7.5 inches. Impression Obsession craft die featuring a background of flowers. This is a single die with 48 flowers measuring 3/16 x 3/16 inches. These are US-made steel dies compatible with most table-top die cutting machines. Embossing folders featuring several background patterns. Paper craft die from Ultimate Crafts featuring a Magnolia Wreath background and corner. Approx size: 5 inches x 3.75 inches. Here is a lovely stand of birch trees, framed and sized to make a perfect layer on a vertical card. Add an extra level of interest to any project. These embossing folders were designed with the modern crafter in mind with deep set designs that work well in almost any embossing machine. Works best with heavier weight cardstock. 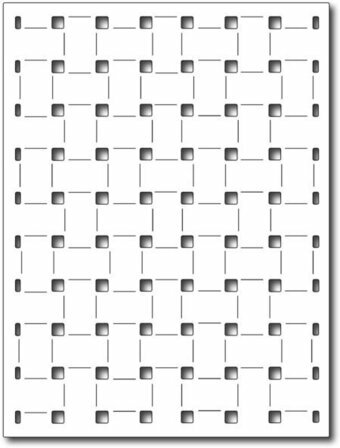 Our Basket Weave Card Panel die measures 3.75" x 5". It makes a fantastic background for easter cards, but also think of using just small portions to create a border for example. This die gives you the look of woven ribbons, and can easily be colored in two tones to enhance that effect. The "Card Panel" dies measure 3.75" x 5" allowing you a nice 1/4" border on a standard A2 card. This gorgeous lacy rose pattern will be perfect for wedding cards, Mother's Day, or any special occasion. Craft die featuring a brick wall background or frame. Pretty and innovative cutting dies to help you create beautiful cards, scrapbook pages and other handcrafted projects! Can be used with most die cutting machines. Measuring 3.75" x 5", our popular card panels will give you a 1/4" border on a standard A2 size card. This fun mod circle design features interlocking circles allowing you to create fun inlay color blocks. Another fun technique is to cut off part of the die cut around select circles to give you a 1/2 panel effect. Marianne Design Embossing Folder Extra - Celestial Stars. This lovely design folder comes in a larger 6 x 6 inch size, and includes a coordinating die to add additional depth and interest to your projects. Size: 5.98 x 6.06 in. Mixed Media Stencil from Brutus Monroe featuring a background of Chevrons. Embossing folders featuring background patterns of dots and chevrons. Marianne Design: Craftables - Chickenwire. 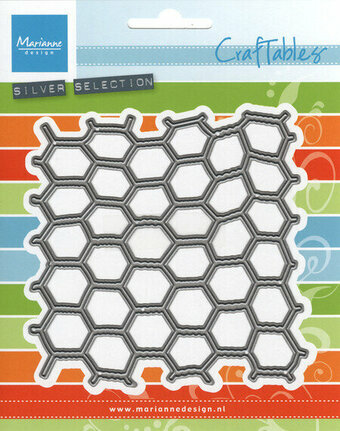 A nice sized chicken wire die that would make awesome backgrounds on your cards or layouts. 1 die. Size: 3.75" x 3.75". Create an entire die-cut background with this Fancy Die. As an added bonus, cut-outs can be collected and used as confetti or shaker mix! Features a background of various circles. Kaisercraft embossing folder featuring a background of gears. Add texture and dimension to paper craft projects with versatile designs! This package contains one 4x6 inch embossing folder. Each sold separately. Photo friendly. Create a ton of confetti for your shaker cards in a flash with this die measuring 3" x 3". You'll get dozens of tiny (1/8") dots, squares, triangles, hearts and diamonds to fill your shakers in a jiffy! This is also great for filling envelopes and explosion cards. Our Frantic Stamper Precision Dies work in most consumer table top die cutting machines such as the Cuttlebug, Big Shot, vagabond, Boss Cut, and Grand Calibur. Craft die featuring country houses. Memory Box/Poppy Stamps craft dies are made of 100% steel. For use on cardstock, felt, and fabric. Cut, stencil, emboss, create! Use in most leading die cut systems. 2.8 x 1.2, 2.1 x 2.3 inches backgrounds, 0.3 to 0.7 inches roofs. 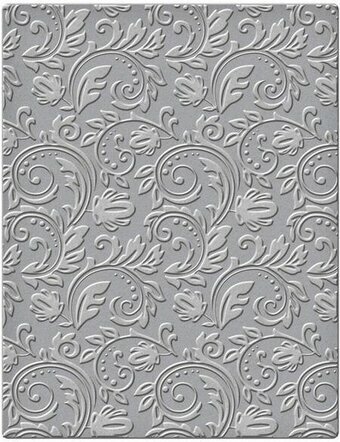 Fantastic value 5in x 7in 3D embossing folder. Works perfectly with most leading brand machines. Add texture & style to all your cardmaking projects. Add incredible depth and dimension to your craft projects with these 3D embossing folders, use them with a variety of different materials for stunning dimensional effects. Fantastic value 5in x 7in 3D embossing folder. Works perfectly with most leading brand machines. Add texture & style to all your cardmaking projects. Add incredible depth and dimension to your craft projects with these 3D embossing folders, use them with a variety of different materials for stunning dimensional effects. 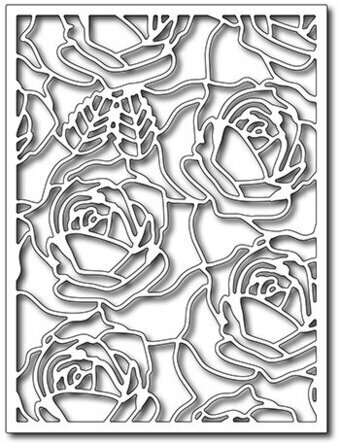 This embossing folder measures 5" x 7" and is called English Rose. This stencil has a simple and attractive pattern made by wavy lines. Includes 1 stencil. Size: 6 x 6 inches. This background die is perfect for creating a fun background with a cracked glass design. Includes 2 dies. Size: 4.13 x 5.8 inches. This background die is perfect for creating a fun background beautiful layered leaves. Includes 2 dies. Size: 4.13 x 5.8 inches. This set of dies designed by Lisa Horton will cut a rectangular background with wavy lines. Perfect for cards! Size: 4.1 x 5.8in. Craft die from Tonic Studios featuring a background pattern of a Diamond Column. Frantic Stamper Precision Die - Diamond Galore Card Panel. As with all our card panels, this die measures 3.75" x 5", giving you a perfect border on a standard A2 card. This detailed and delicate design offers a geometric pattern, perfect for Art Deco style cards. Due to the intricate nature of this design, we recommend using a metal shim and running the die at an angle in your machine. By that, we mean rather than running the die straight on, start the die through the rollers with a point in first. You may need to run the die through your machine 3 or 4 times, rotating the die a bit each time to get a perfect cut. This is due to sweet spots in different machines, and the intricacy of the design. Our Frantic Stamper Precision Dies work in most consumer table top die cutting machines such as the Cuttlebug, Big Shot, vagabond, Boss Cut, and Grand Calibur. Some dies may require the use of a metal shim depending on your machine. A modern diamond pattern, in a stencil. Hero Arts stencils are made of thick frosted mylar with premium laser-cut images. Use a paintbrush, ink pad, dauber, or spray to leave a stylish impression. Measures 6″ x 6″. Light up your cards with the Stars in the Sky Die-namics. This design will sprinkle your projects with a constellation of stars. It's the perfect way to add a finishing touch to a nighttime scene. Layer the negative over sparkly paper for extra shimmer and either inlay the positive stars or use them for confetti in a shaker card! The Stars in the Sky - Horizontal Die-namics measures 4 7/8" x 2 1/8". MFT Die-namics dies are our very own EXCLUSIVE, American made line of steel dies. Die-namics dies work with most tabletop die cutting machines such as the Big Shot & Cuttlebug. Our Double Diamonds Card Panel die measures 3.625" x 4.8". It makes a beautiful airy background for perfect for masculine cards and feminine cards. This die gives you the look of argyle or a trellis. Spellbinders Em-bossing Fold'ers offers options for your beautifully detailed embossing and letterpress creations. The Floral folder brings a burst of swirly petals in a beautiful pattern to the design. The sandwich for Single Sided Em-bossing Fold'ers in Spellbinders Platinum Machine is: Platiform, Embossing Folder with medium inside and One Cutting Plate.